Your vacation object: The owner lives permanently in the house. In the same house holiday apartment CRI CRI 553 are (5 persons) and CRI CRI 554 (3 persons). To use available: barbecue possibilities. 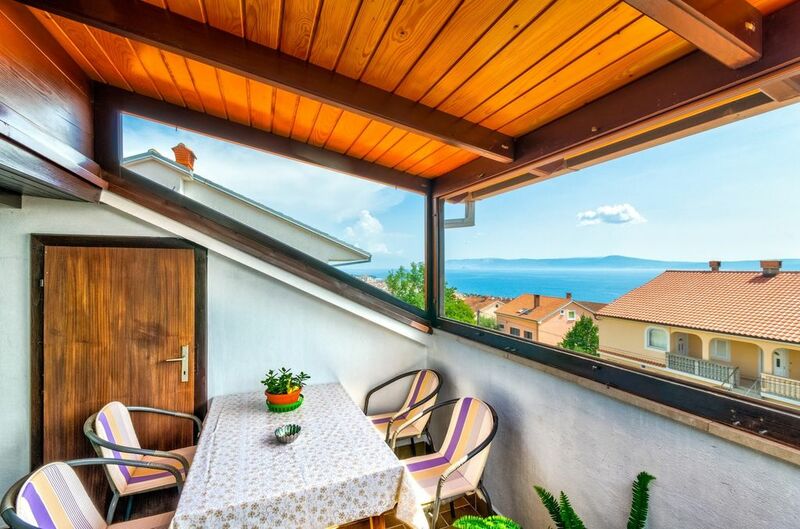 Your holiday apartment: 3 rooms (therefrom 2 bedrooms), 50 sqm, 5 persons. Air conditioning. Entrance on the 2nd floor, through the internal stairs into the corridor. 2nd floor: kitchen living with 1 additional bed on the couch/sofa, sitting area, dinette, tv and access to the balcony. 2 bedrooms each with 1 double bed and dinette. kitchen with dinette (6 places), gas stove (3 flames), electric cooker (1 cooking plate), dishwasher, refrigerator (icebox), microwave and coffee machine. bathroom with bathtub and WC. Other facilities: Internet access (WLAN). Television available by satellite. Pets: nicht erlaubt.